Rabbi Danny Kada was born in London where he also grew up and still resides. After graduating from Menorah Grammar School, Rabbi Kada spent 4 years studying in Yeshivot in Gateshead and Jerusalem. He subsequently studied for Semikha (rabbinic ordination) under the tutelage of former Chief Rabbi Mordechai Eliyahu z”l and was awarded his semikha by the Chief Rabbinate of Israel. Simultaneous with his Semikha studies, Rabbi Kada took part in Ner Le’elef, a global programme for training outreach educators. 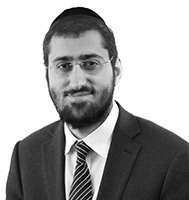 Since returning, Rabbi Kada has been heavily involved with the Sephardi community in London. Currently, Rabbi Kada is the rabbi of the Wembley Spanish & Portuguese Synagogue and works for Torah Action Life (TAL) an organisation catering for young Jewish professionals from across the community. He is a regular lecturer at Tiferet Eyal Synagogue in Hendon where he also leads the morning Kollel as well as regular lectures at Kneset Yechezkel in Golders Green . Rabbi Kada is greatly assisted in all his endeavours by his wife Tamar, and is blessed with two girls; Ayala and Sarah. To view Rabbi Kada’s blog click here.